Why are religious leaders being arrested when they seek to prevent the shutoff of water services to families who cannot afford to pay bloated bills? The answer is that, thanks to Michigan Governor Rick Snyder, Detroit is again providing a stark example of what happens when right-wing officials implement an unthinking and inhumane austerity agenda. Since Snyder imposed “emergency manager” control on Detroit last year— effectively disempowering local elected officials and putting the governor and his appointees in charge—the city’s residents have faced plenty of threats from unelected “managers” who are determined to balance the books of a financially strapped city on the backs of its hardest-hit residents. But none of those threats has been so extreme, or so dramatic in their illustration of the crisis created by austerity policies, as the rush by the Detroit Water and Sewerage Department (DWSD) and its for-profit contractors to shut off water to some of the poorest families in America. Under pressure from the governor’s emergency manager, the DWSD has so far this year shut off the water for approximately 17,000 households and small businesses that owed on their bills. And that’s just the start. In a city that has been brutalized by deindustrialization— where the official unemployment rate is 14.5 percent and where the real rate is dramatically higher; where 44 percent of residents live below the poverty line—water rates have spiked by almost 120 percent over the decade. Even as the city has gone through a bankruptcy crisis, rates have continued to rise at a dramatic rate. Families and small business owners have struggled to keep up, but today an estimated 138,000 accountsare past due— including those of roughly 90,000 low-income families. Many families have paid their bills by cutting back on other necessities, but many others are struggling—while, at the same time,Snyder’s managers are pocketing hefty checks and toying with privatization schemes that have the potential to enrich private, out-of-town interests. The official rationale for the water shut-downs—the Detroit Water Department’s need to recoup millions collapses on inspection. Detroit’s high-end golf club, the Red Wing’s hockey arena, the Ford football stadium, and more than half of the city’s commercial and industrial users are also owing—a sum totalling $30 million. But no contractors have showed up on their doorstep. The targeting of Detroit families is about something else. It is a ruthless case of the shock doctrine—the exploitation of natural or unnatural shocks of crisis to push through pro-corporate policies that couldn’t happen in any other circumstance. The congressman has aligned with the Detroit Water Brigade, a grassroots movement that is organizing to stop the shutoffs and to get water to families. They’ve drawn international support. Canadians living across the river in Windsor have been organizing to deliver water to Detroiters. But Detroiters have over the past several years come to be recognize that the plight of their city, even as it is assaulted by the governor’s austerity measures, is often neglected by federal officials. 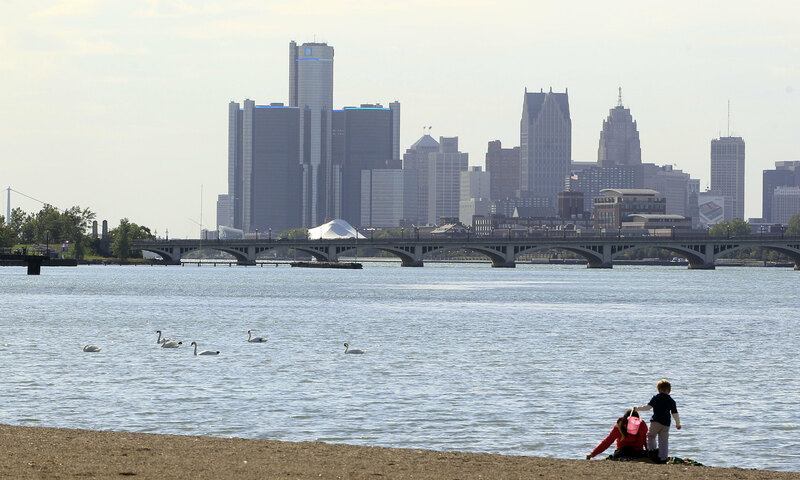 It will be harder to neglect Detroit in coming days, however, as Netroots Nation brings its ninth annual gathering (and Vice President Joe Biden and Senator Elizabeth Warren) to the city. And National Nurses United, the activist union that has been promoting a “Robin Hood” tax on financial speculators as an alternative to austerity cuts, is working with dozens of local, state and national groups to organize a July 18 “Turn on the Water! Tax Wall Street!” march and rally. Now they have come for our water. Let’s Tax Wall Street, Get Our Money Back, and Turn on the Water!